There’s a storm brewing on the horizon for shippers and it may arrive at the worst possible time – during the fourth quarter holiday season. Besides the typical scarcity of available trucks during this peak season, the war between Walmart and Amazon promises to siphon off a big chunk of capacity as Walmart threatens to drop any carriers/truckers that haul for Amazon. Add to this, the December 18, ELD mandate start date, which is expected to force a significant number of driver/operators to retire and further inflame capacity challenges. What can shippers do to avoid catastrophe in December? The threat is real. Capacity will be tougher than ever. 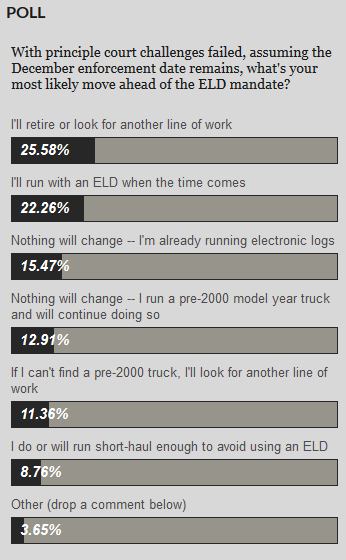 Despite growing hope among small common carriers that Congress may carve them out an exception to the ELD mandate, industry experts predict the mandate will occur according to schedule. When it does, expect a sizeable chunk of the smaller carriers – the ones most often willing to accept the less-desirable lanes and last minute tenders – to make for the exit ramps. A poll of drivers in Overdrive magazine reveals that 38% of independent truckers intend to retire unless they’re spared the mandate. Alone, this drain on capacity during peak season would be disruptive enough. Bake in the capacity hoarded away by Walmart and the outlook is grim. The solution is also real, but only if smart shippers with strong TMS solutions and well-conceived routing guides take aggressive action now! Looking back to the data stored in TMS from last year’s fourth quarter, a shipper can determine which carriers were relied upon most to ensure on-time delivery and the highest levels of tender acceptance. Shippers should also look at the data to determine which small carriers they may have leaned on last December to move freight in challenging, non-core lanes or on short notice. After compiling this list of most frequently used carriers, shippers should waste no time reaching out to these haulers. Find out if the carrier does any shipping for Amazon or Walmart and what their intentions are with respect to the gauntlet thrown down by Walmart (although it’s safe to assume most carriers would prioritize access to Walmart volume). Ask the smaller, niche carriers if they intend to continue service in spite of the ELD mandate. Better to find out now if there is a possibility the carriers used in 2016 will not be available for the shipper in 2017 for either of these reasons. Next, shippers should examine their routing guide. A typical shipper may have 5 or 6 carrier rates for each lane in their routing guide within TMS. Yet, most of the year, loads are accepted by the first or second carrier – less frequently the third, but rarely (if ever) by the fourth, fifth or sixth. Carrier 4, 5 and 6 – never seeing any loads coming from the shipper – won’t be particularly motivated to come to the aid of shippers that never swing any business their way. As a wise hedge against the impending capacity nightmare, shippers should consider sending a bit of freight via the small shippers further down in their routing guide (after confirming they intend to soldier on in spite of the ELD mandate). Having a bit of good will banked early will pay dividends when the crunch occurs; when other, less forward-thinking shippers begin seeking capacity among the small carriers they’d neglected for so long.